For the last few years Castlerigg have been to Big Church Day Out North, and we are really disappointed that it isn’t running this year. But if you can get to Wiston House, West Sussex, this is an opportunity to experience and celebrate modern worship music with famous names live on stage. 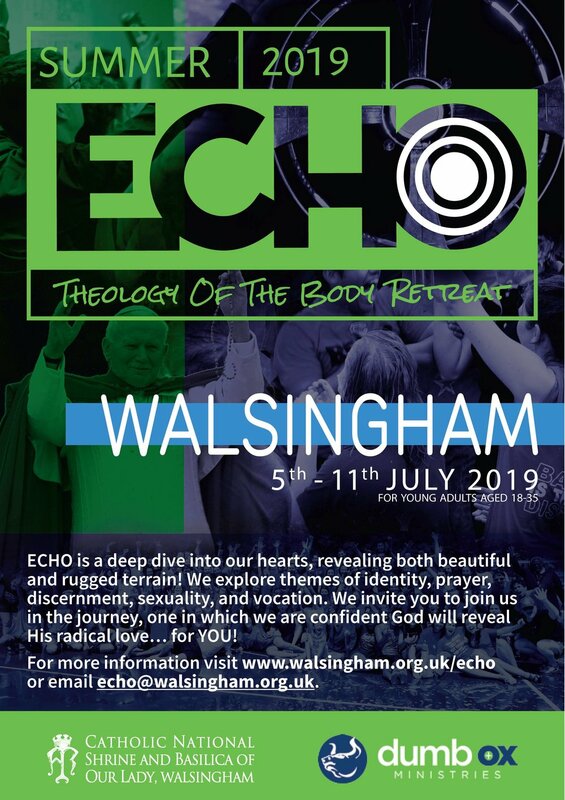 The Catholic National Shrine of Our Lady at Walsingham is collaborating with Dumb Ox Ministries to run an 'ECHO' theology of the body retreat for young adults aged 18-35 in Walsingham between 5-11 July 2019. At ECHO, we will probe into questions like: What does it mean to be a man or woman? What does it mean to be a son/daughter, brother/sister, husband/wife, father/mother? What does it mean to really love like GOD? What does it mean to have authentic, pure, life-giving relationships? How can being single, dating, religious life, marriage become a life-giving experience? An amazing opportunity for young adults to come together to celebrate their faith at the National Shrine, with great music and speakers, and a festival feel.